Since shameless self-promotion has turned directly into eyes, that most valued of commodities to egotistical proto-writers, so I figured I would name today’s update after that. I’m actually going to be touching on all the technical things I’ve done with the site this week, though, all of which support the whole self-promotion campaign in various ways. Number one is caching. Many Words runs on a virtual private server that is, if we’re honest, quite poor performance-wise. There are a few WordPress plugins that will cache post pages (which are usually generated by PHP) as static HTML pages, which only go through the web server (faster than PHP by a ton). This site has never seen traffic that would make such caching more than a novelty, but I’m an optimist, for one, and for two, it might help the next time the VPS provider experiences some slowdowns. Number two is metadata of various sorts, with two aims: easier sharing and better search engine performance. Now, for Bing, I’m already doing pretty darned well for the queries I care about (‘many words’, mainly, which, given the dash in my domain name, is a pretty important one), but on Google I barely even register for the exact same query. I don’t quite understand why, although I’d imagine it has something to do with backlinks and my not having very many of them. To try and improve that, I made sure that ‘many’ and ‘words’ are in the list-o-keywords in meta tags for each page, which will hopefully weight them more heavily in Google’s list-o-keywords-associated-with-me. I guess we’ll see. Easier sharing counts as number three, given that it’s important; some of the other metadata added by this plugin puts the fancy new logo next to shared posts, and gets the title and description right for Facebook at least. I’ve also started an author page on Facebook, which is listed under the ‘Be a Joiner’ heading over to the right along with my Twitter wotcha, and above some sharing buttons right beneath those, under the heading ‘Tell Your Friends’. Those will always share the current page, so you can be a little more specific in telling your friends. Which I would appreciate. Just saying. There’s also one other thing: the logo1 that shows up when a post is shared on Facebook, and which is also used as the logo on the Facebook page (you can follow it with the link in the sidebar! ), struck me as something that would look great on a mug. 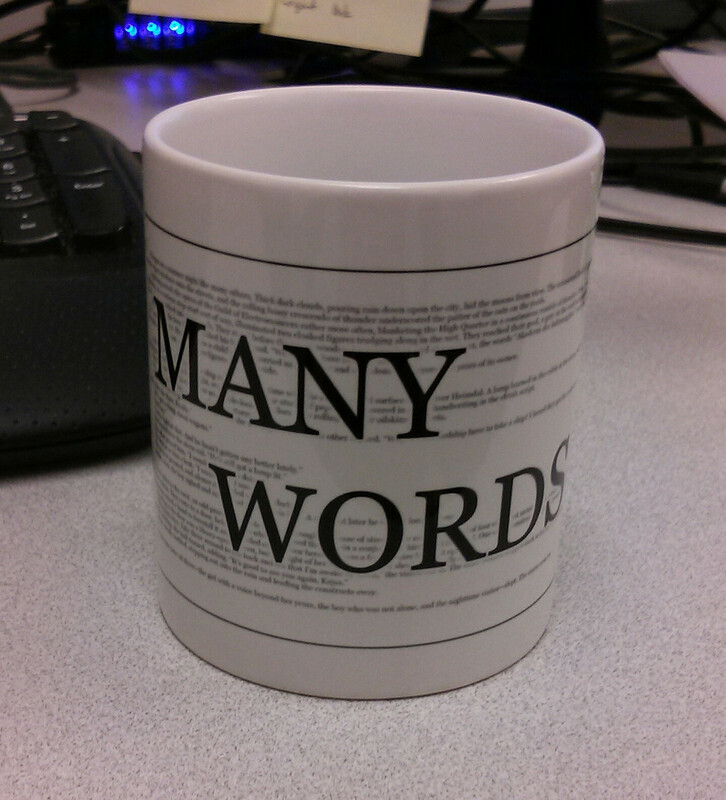 After sending CafePress an absurd amount of money and waiting a week or so, I got a mug in the mail. It’s very nifty. 1. Courtesy of a friend of mine, so credit to him.